Sojourners’ President Jim Wallis and CEO Rob Wilson-Black have just returned this week from an incredible and moving experience at the World Economic Forum in Davos. Jim was honored to be invited to give the final closing remarks, alongside World Economic Forum Founder and Executive Chairman Klaus Schwab and the tremendously talented cellist and composer Zoe Keating. Jim’s closing talk which can be read and viewed here , called on those in positions of leadership to implement values that benefit the common good and emphasized the importance of the New Social Covenant . * As Jim reports, the response was very deep and unusually personal and emotional for Davos. It was an invaluable opportunity to infuse faith, values, and a call to action for the “least of these” to be heard and experienced by all 2,000+ attendees. *We strongly recommend watching the video , as Jim’s spoken word was followed by Keating’s musical genius, creating an interwoven closing performance that is quite moving. Immigration is also top of mind for us here at Sojourners as we start 2014, especially since the end of 2013 saw a powerful spiritual and political response to our Fast 4 Families  (which ended up receiving more than 2,000 press hits, between print, online, and both national and local television hits). 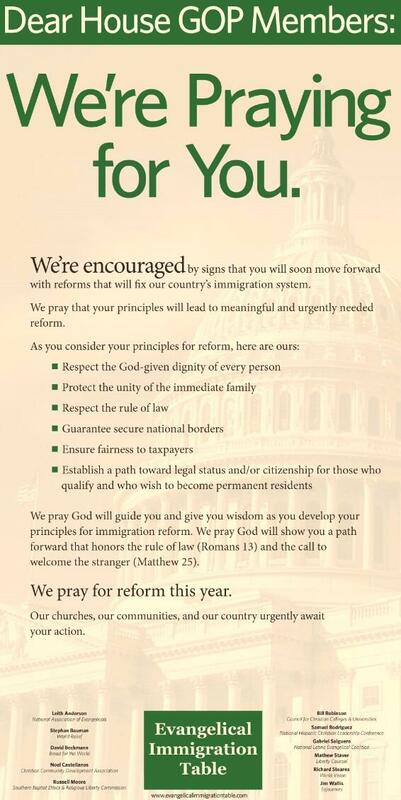 Just this week, the Evangelical Immigration Table (EIT), where we’ve been an active leading partner, posted a full-page USA TODAY ad directed at Republican Congressional leaders (see the ad copy here ). EIT has also expanded its paid media campaign to conservative websites  including Townhall and RedState. This comes on the heels of an encouraging New York Times front-page article  on Jan. 1 looking at House Speaker John Boehner’s recent actions indicating immigration reform might be possible this year. Jim is quoted in the article, and sums it up best: “ That’s our first window. We are organizing, mobilizing, getting ready here. I do really think that we have a real chance at this in the first half of the year.” The time is now for immigration reform, and we thank you for your consistent and faithful support in this campaign! Stay tuned also as we continue to build momentum around phase two of the Fast 4 Families, which will include dozens of visits to congressional districts as well as a Fast 4 Families Across America Tour that launched this week and is set to end April 9 in Washington, D.C. This month also saw the release of The Shriver Report: A Woman's Nation Pushes Back from the Brink, a landmark study and report examining the problem of poverty as it pertains to women and proposes solutions to eradicate it. It was a well-timed release, as we celebrated the 50-year anniversary of Lyndon B. Johnson’s War on Poverty declaration, and it offers a real opportunity for us to influence the national dialogue and engage the faith community. Jim wrote a great piece in the Huffington Post  about how empowering women ties into our broader work on economic and gender justice (which was retweeted by Maria Shriver ! ), and we look forward to exploring how we can further partner in this movement to create economic stability for more women and families. The Google Hangout, featuring Jim Wallis and Michelle Gonzalez, the author of our January 2014 Sojourners magazine cover story “Breaking the Habits of Machismo” is now rescheduled for Wednesday, Feb. 12, at 12 p.m. EST. This will be a robust and lively conversation digging deeper into what the Bible really says to encourage, affirm, and empower women and girls in their call to be leaders. The updated link and invitation for this event will be sent out the first week of February, so keep your eyes peeled for that. New York Times Columnist David Brooks wrote about Sojourners staffer Catherine Woodiwiss' reflection on trauma and her family’s journey through grief. Read his reflection here  and Catherine’s original piece here . Catherine’s words are powerful, personal and profound – we honor her voice, her struggle, her journey, and her courage daily in our office, and continue to pray for her recovery, both physical and spiritual. an interview on the O'Reilly Factor , for a segment about Pope Francis. A major focus of the piece was on the economy. an interview on the Ed Schultz Show, again discussing Pope Francis and his message of income inequality. You can listen to a recording of the podcast here. (Make sure that the podcast titled “KCCA: The Ed Schultz Show Thurs Jan 2, 2014 is playing. Jim’s interview runs from 9:21-19:50). Jim also recorded a short sound byte for an AP news clip on Jan. 7 that was used for radio stations around the nation, in response to the pope saying that pastors should be engaged in their communities on the ground and on the margins of society. His quote was “Every pastor in America knows people in their congregation who are looking for work, looking for jobs and the people looking for work are already generally among the poorest.” Let us know if you are interested in hearing the radio spot, and we’ll send you the media file. All of this is possible because of the support and encouragement of our friends and generous supporters, so thank you! What a way to kick off the New Year. If January is any indication for how the rest of the year will pan out, we’re in for an extraordinary 2014!